Favourite Rizeena will bid to give 79-year-old local trainer Clive Brittain victory in the 1,000 Guineas at Newmarket on Sunday. Brittain is bullish about the chances of a third triumph in the race after Pebbles in 1984 and Sayyedati in 1993. "We are going to the Guineas with a very fine chance," he said. Chief opposition comes from the likes of Lucky Kristale, Miss France and Bracelet. Rizeena, the daughter of Iffraaj, won the Queen Mary at Royal Ascot last year over the minimum five-furlong trip. She went on to land the Moyglare Stud Stakes at the Curragh before a fine second to Chriselliam in the Fillies' Mile on her final two-year-old start. "Rizeena proved last year that she was top class and shows all the signs that she has improved from two to three just as both Pebbles and Sayyedati did," said Brittain. "There are 19 runners so you always think you need a bit of luck, but if you've got the best horse you'll win. That's the way I look at it." 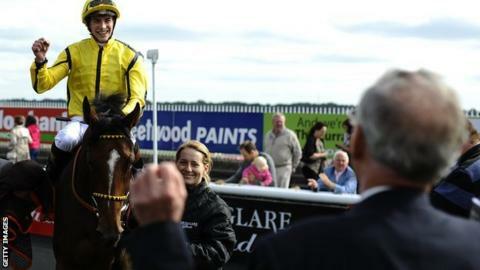 Champion jockey Richard Hughes comes in for the ride on Rizeena, with her previous partners having other commitments. Ryan Moore rides Bracelet for the Aidan O'Brien team, while James Doyle is on Lady Cecil's Joyeuse.